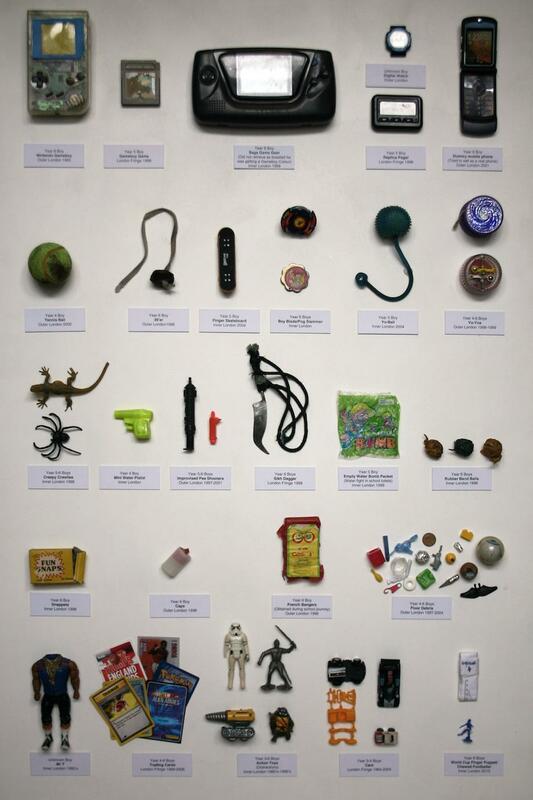 These “confiscation cabinets,” assembled by veteran teacher and artist Guy Tarrant, are an unusual archive: toys taken from London schoolchildren in 150 different schools, over thirty years. 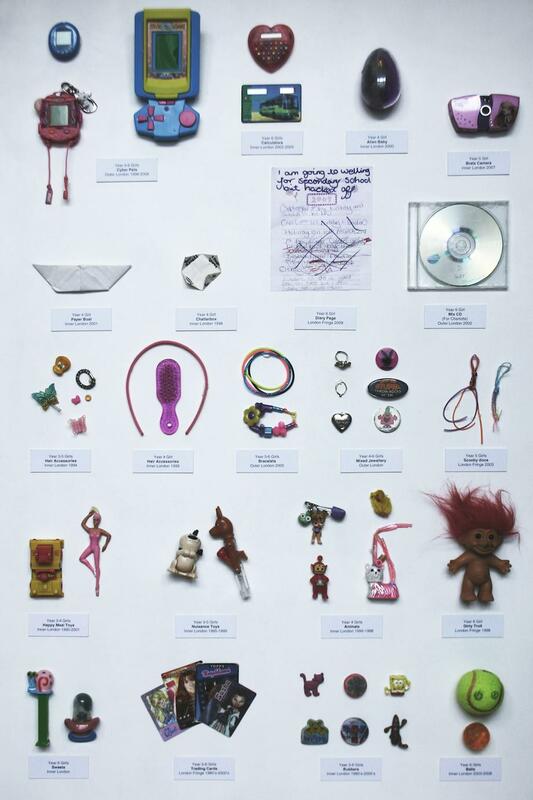 Tarrant became interested in the toys as tokens of resistance to school routines and teacherly discipline. He enlisted other teachers to donate their own confiscated items to his project. In all, he made eight such cabinets, which are currently on display at the Victoria & Albert Museum of Childhood in London. Besides showcasing the creativity of some rebellious children—improvised pea shooters, World Cup finger puppets, and mix CDs feature in the collection—the grouping lets us see some differences between American and British toys. A “Scooby doo” appears in the girls’ cabinet, and seems to be some kind of a friendship bracelet. In the boys’ cabinet, there’s a Sikh kirpan, or ceremonial sword, reflecting the large Sikh immigrant population in the UK. (Recently, Sikh advocacy groups have fought the confiscation of such items as a restriction of religious freedom.) And there’s a “39’er,” which appears to be a “conker” (or horse chestnut) used in the traditional British kids’ game. Technological change and fads also affect the makeup of the confiscated items, with Gameboys, Star Wars toys, and a grungy troll doll showing the march of time. When viewed from afar, the girls’ cabinet is significantly pinker than the boys’, showing how gendered marketing reaches right into the smallest of items made for kids. Thanks to Alex Goodall and Thomas Ruys Smith for enlightening this American on the subject of conkers. Click on the images to reach zoomable versions. Correction, November 27, 2013: The original post characterized the Sikh kirpan as “fake,” presuming it was a plastic replica.